The sequel to 'The Boy in the Branch', the film revisits the RSS, a Hindu right-wing organization in India after a gap of eight years. 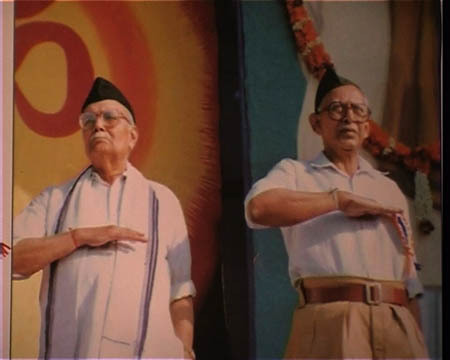 In early 1993, Lalit Vachani and the Wide Eye Film team completed a documentary film, The Boy in the Branch, for Channel 4 Television, U.K. Set at the headquarters of the RSS in Nagpur, the film was about the indoctrination of young Hindu boys by the RSS - the force behind the Hindu nationalist movement in India. Eight years later, Vachani returned to Nagpur to meet the characters from his earlier film. At one level, this is a film about memory. It is a documentary in the form of a personal revisit where a filmmaker returns to the issues, the locations and the subjects of an earlier film. At another level, The Men in the Tree is a political documentary on the RSS and Hindu fundamentalism. It is about some of the individuals, the stories and the myths, the buildings and the branches that enable the growth of the RSS and its Hindutva ideology.